Including a bunker and/or silo in your process installation is an effective method for (temporary) storage or buffer between various machines and processes and/or regular dosing of bulk goods. According to your requirements, Heilig Mixers can design and manufacture a variety of styles and types with a stand-alone purpose, mobile units or fixed units as part of a configuration. Apart from a storage function, a bunker or silo can also be put to use as a feeding unit. In that case, we can design a bunker with a conveyor system tailored to your needs. 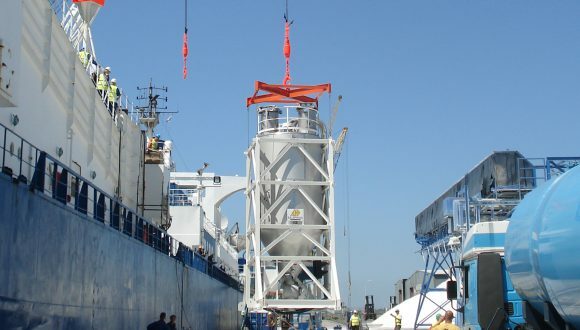 One of the options may be to install the bunker or silo on top of load cells for measurement or to supply a design according ATEX regulations. We offer our designs in different dimensions and manufacture them in various steel alloys. For abrasive or heavy duty applications, your bunker can be supplied with abrasion-resistant coating or can be constructed from Hardox. A bunker or silo can also have a dosing or feeding function aside from the storage purpose. Our designs are manufactured in a wide variety of sizes and constructed from carbon steel or stainless steel in various grades. The mobile ATEX models are transportable via road or water. To prevent flowing, bridging, product segregation, and ratholing, we apply specific properties to our products. Of course, we offer silos that have a mixing function as well. For both bunkers and silos, we have many designs and examples to share with you. Please feel free to contact us for a specific request or a personal offer.